Jacobs, Landry, Rogers and O’Dell participate in the traditional coin pour. 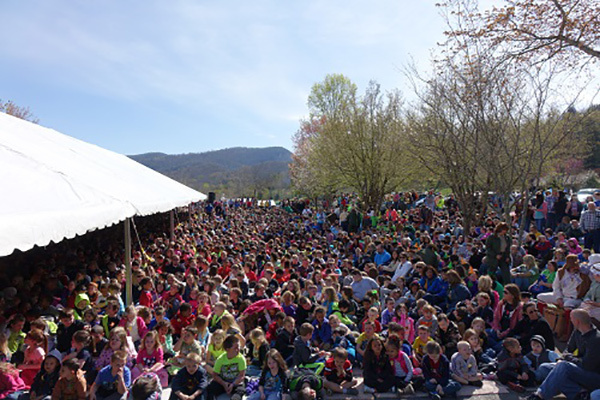 Hundreds of historical re-enactors and a large cadre of National Park Service (NPS) rangers converged on the grounds of Cumberland Gap National Historical Park April 9th – 11th for An American Memoir: From the Hearts of Our Ancestors…Into the Hands of Our Children. 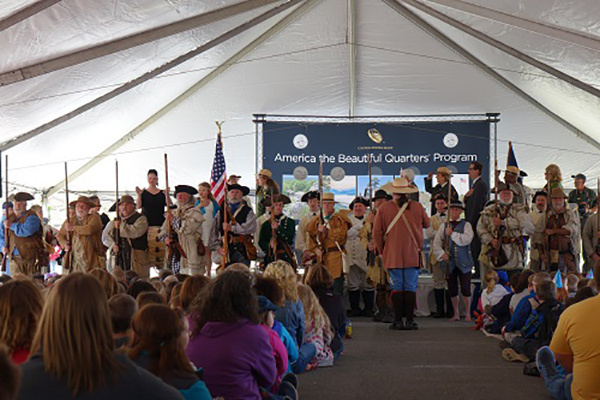 The ceremonial launch of the Cumberland Gap National Historical Park quarter was the grand finale of this living history event, which took place on Monday, April 11th at 11:00 a.m. The 32nd coin in our America the Beautiful Quarters® program honors Kentucky’s ‘Doorway to the West,’ the break in the Appalachian Mountain chain through which countless pioneers traveled on their westward journey. More than 3,600 people packed the visitor center’s parking lot, including nearly 2,700 school children who were sworn in as junior rangers during the ceremony — the largest en masse swearing in of junior rangers in NPS history. The Watauga Valley Fife & Drum Corps entertained the swelling crowd. A trio of young fiddlers, the Smith Brothers, also joined in the pre-event entertainment. Over Mountain Victory Trail Association had the honor of presenting the colors, drawing a hush over the crowd with their impressive group of musket-bearing living historians. Middlesboro (KY) Elementary fourth graders Hattie Landen and Makaya Patterson served as masters of ceremony. Both students are part of their school’s The Leader in Me Program. Donna McClure, Field Representative from Senator Mitch McConnell’s office, read a letter from the senator and presented a flag that had flown over Kentucky’s Capitol in Frankfort. Congressman Hal Rogers addressed the crowd, asking the kids to imagine what it would be like to leave their home, to leave everything behind and never return. NPS Southeast Regional Director Stan Austin had the honor of leading the oath for the thousands of new Junior Rangers. Cumberland Gap National Historical Park Superintendent Jacobs, United States Mint Plant Manager Marc Landry, Congressman Rogers, and National Park Service Deputy Director O’Dell participated in the ceremonial coin pour into a replica of the Gap. Home Federal Bank in Middlesboro, Kentucky, was on site for the coin exchange following the launch ceremony. The line stretched around the parking lot, with Home Federal exchanging $26,000 in quarters in less than an hour. The U.S. Mint also hosted a coin forum on Sunday, April 10th from 3:00 p.m. to 4:00 p.m. at the Pine Mountain Resort State Park C.V. Whitney Convention Center.